Anyone who has had the pleasure of eating handmade pasta can tell you, the difference from the packaged stuff is vast. Fresh Pasta is like placing a silk scarf across your tongue in texture, while offering a rich, flavorful, and savory vessel for sauces, oils and ingredients to rest upon. This Guide to Making Fresh Pasta has a very Easy Recipe, making for a delightfully light and silky homemade pasta, sure to be envied by even the best of culinary arts practitioners. This Pasta Guide is designed to educated you on the perfect ingredients and techniques, for the best pasta possible. You will find written directions, photographs, and video that offer you the most comprehensive pasta education right here and right now. You can be making your homemade light and silky pasta for dinner tonight, and in just minutes. Once you create your dough following the steps provided, you will see that even a novice home cook can create the most decadent pasta. 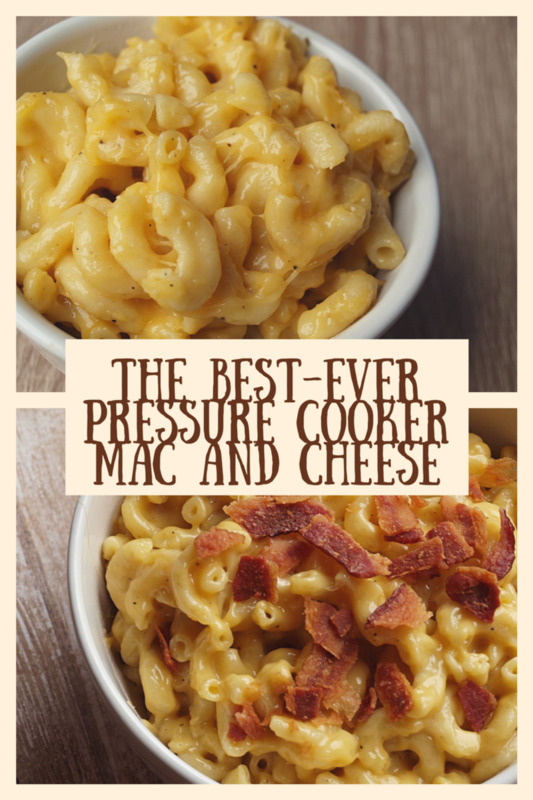 It is easy, quick, and a soon to be ballet of flavor on your taste-buds. Now, let's get learning how to make Handmade pasta, quick and easy! What are the Ingredients in Handmade Fresh Pasta Dough? A Simple silky Handmade or Homemade pasta dough can have very few ingredients; flour, salt, egg, and in the best handmade pasta recipes, good quality olive oil. As you gain more courage and technique you will find that sometimes homemade pasta can have several ingredients. You can add a variety of ingredients to your pasta dough, including fresh herbs (basil, Italian parsley, sage), squid ink (adds a vibrant black color to the pasta), black pepper, tomato, spinach, saffron, porcini (wild dried mushrooms), chile, and many, many more ingredients, even a nice Chianti (Italian wine). 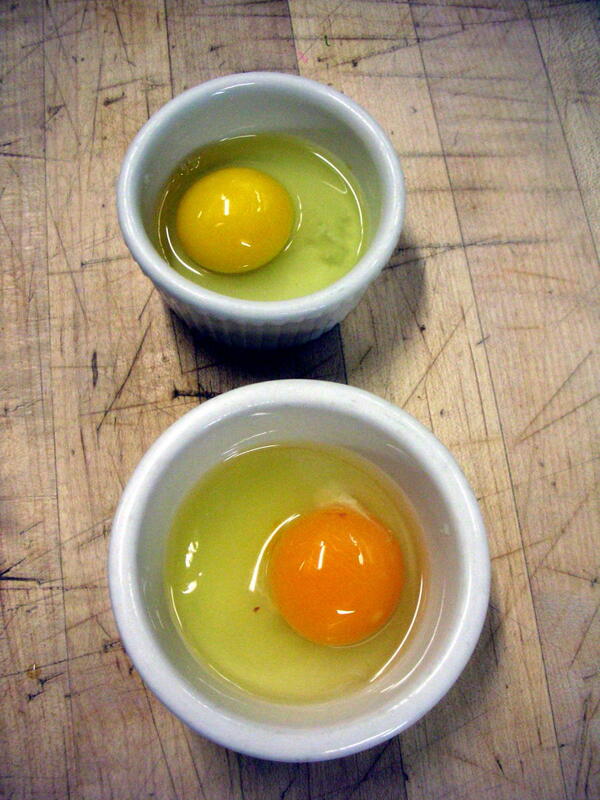 It is easy to see the huge color difference between a store bought production egg, and a fresh free range egg-- look for brown or pastel blue colored shells. 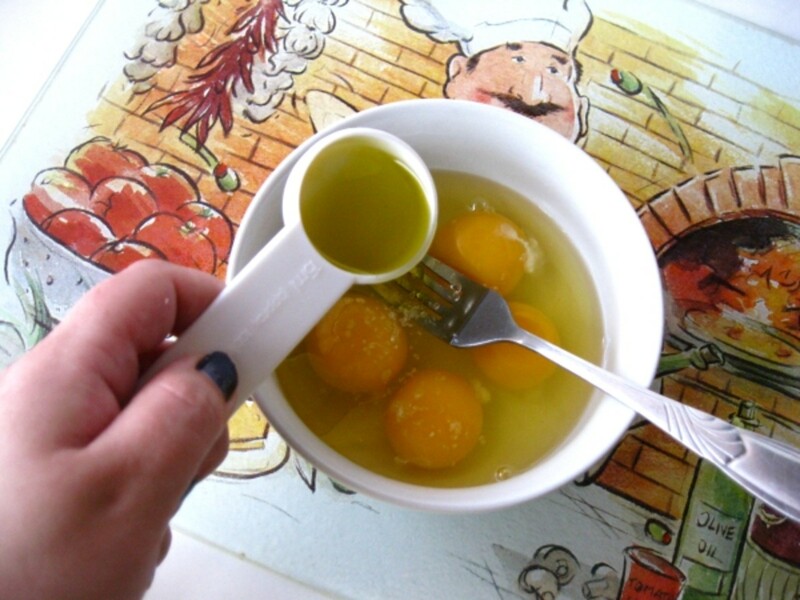 When Olive Oil is among your fresh pasta ingredients, be sure to add it to the mix at the same time you add your eggs. Thinking of a Culinary Arts Education? Find great Information here! EGGS: I use a pasta dough that includes eggs, because I enjoy the color, flavor, and texture the yolks provide. I have learned it is very important to use really fresh eggs in the making of pasta. I have also learned over the years that the darker the yolks are, the better your pasta will be. Some egg farmers say that hens that are fed a diet rich in corn and low in wheat grains will lay a deeply colored yolk; however I'm not certain this has been substantiated. Once you have chosen your eggs, it is highly recommended that you only use these eggs at room temperature when making pasta dough. SALT: Salt is a very critical flavor component for a good pasta. It actually has a chemical effect that excites our taste buds when eaten. If you want to check this information, take a tiny bite of chocolate and allow it to melt on your tongue. Then place a few grains of salt on a second tiny bite of chocolate, place it on your tongue allowing it to melt. You will notice a souped-up version of the first taste of chocolate because the salt has activated chemicals that "wake-up" your flavor-detecting taste buds. Besides, who wants to eat bland pasta? OLIVE OIL: In Tuscany, olive oil is added to fresh handmade pasta, giving the pasta a divine soft texture and a nicely enhanced flavor; some say it also helps to make the pasta dough easier to work with, primarily if you don't run it through a pasta machine, choosing to create handmade, hand rolled, traditional fresh pasta. You will want to add the olive oil at the same time you add your eggs to the flour, this allows the olive oil plenty of time to get dispersed throughout the pasta dough. "00" wheat floour is the top choice when making handmade pasta dough. No matter what flour you decide to use, be certain it contains GLUTEN, the gluey protein substance that causes dough to be sticky. 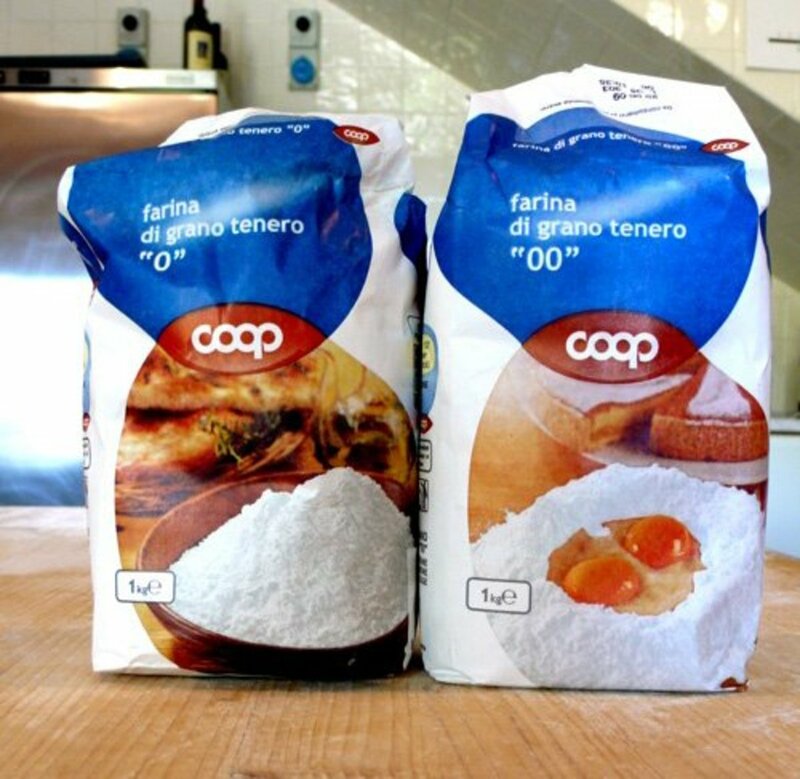 FLOUR: If you are a purest and want to make only the most Italian, top-notch, world class fresh pasta, then you will only want to use the most Italian, top-notch, world class best flour; which is called Farina Bianca 00 -or- Tipo 00 , usually found at Italian specialty stores. 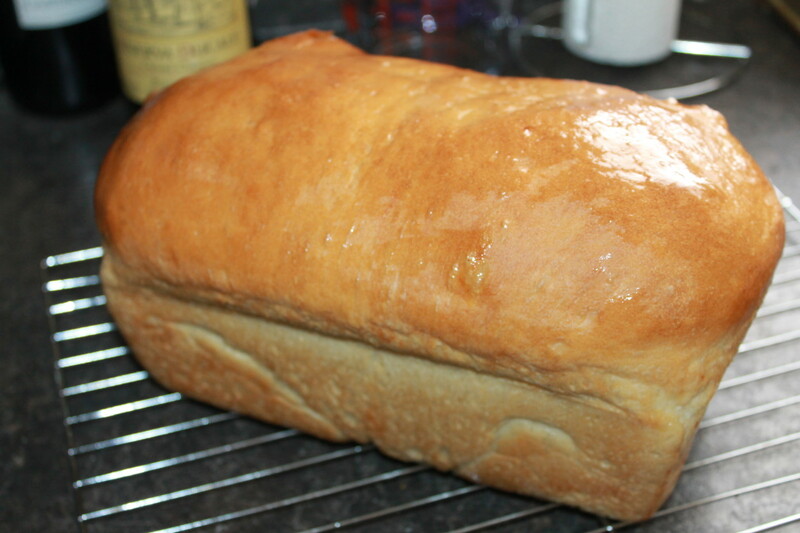 (In case you were wondering, "Farina Bianca" means "white flour" in Italian, but only the very finest white flour). The "00" flour is very fine, and a soft white wheat flour that will make it far easier to work the pasta dough. If you use regular all purpose flour your pasta will turn out just fine, but it will be a little harder to work with, having a somewhat tough pasta texture in the end. If you want something in-between perfect handmade pasta and just fine handmade pasta, try using a strong stone-ground bread dough. You can use just about any flour, including whole wheat or corn flour, but What ever flour you decide to use, be certain it contains GLUTEN— or the proteins found in flour. These proteins form gluten strands, which create a trellis type protein array, which in turn makes a support web for the dough, bringing the light silky texture that we crave— as this is crucial for an awesome handmade pasta or any pasta for that matter. If you use a flour without gluten, you will need to add gluten for your flour to do its pasta dough job. Never skimp on the kneading time of your pasta dough or your final pasta will not be silky and light! Fresh Handmade Pasta with these 6 Easy Steps! Put the flour and salt in the vessel of your food processor. Make sure you have the metal blade attachment in place before adding any ingredients. Attach and lock inplace the top of the food processor. 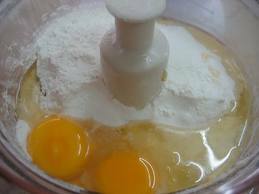 Add 1-whole egg, pulse-blend until the flour, salt, and 1-egg are mixed. Turn the food processor on full speed and add the 2nd and 3rd whole eggs using the feeder tube. Only run the machine until the mixture "just" becomes a dough. Turn the dough out on to a clean work countertop. (Surprisingly, wood countertops work best with pasta dough, as this top maintains a naturally warm surface temperature, which pasta dough really prefers.) 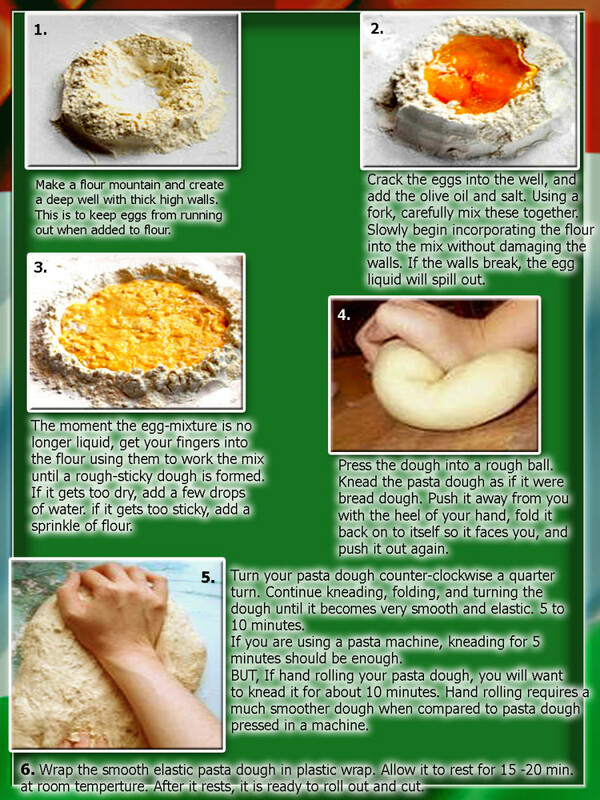 Knead the dough just like when making pasta dough by hand. Then wrap it in plastic wrap and allow the pasta dough to rest for 15 - 20 minutes at room temperature. AN EASY "HOW TO" FOR ROLLING OUT, CUTTING, AND HAND SHAPING YOUR FRESH PASTA DOUGH! Cutting and Shaping Pasta by Hand Article - Homemade pasta can be cut into many shapes and sizes but the options are limited in comparison to factory made dried pastas. Hello. So I wanted to let you know how the pasta experiement turned out. Previous to posting I had made sweet potato gnocchi. I thought I should try gnocchi again since I knew it best. In the past I had made cheese gnocchi and the regular potato gnocchi. This time I tried making butternut. With really great results. Everyone, liked this a lot and said they liked it probably best. However, my daughter is a cheese girl so she said it was a close second to the cheese gnocchi. I am going to try yucca next. After I have tried a few root vegetables as gnocchi I will move on and try to see how I can make them into other shapes - and types of pasta. I am limited since I don't have a pasta machine nor any "tools" to do this. That is why I have stuck with the gnocchi. I have a cheese grater and I use the small side to texture the gnocchi (it's the way my grandmother showed me to make it). Thanks for your reply. Lu~ You know I haven't. I usually stay with a spice or herb style pasta, keeping these as delicate in flavor as is possible for the sake of the dish. But, wow! You have a really great idea. I would be interested in knowing how it turns out for you. Thank you for your remarks. 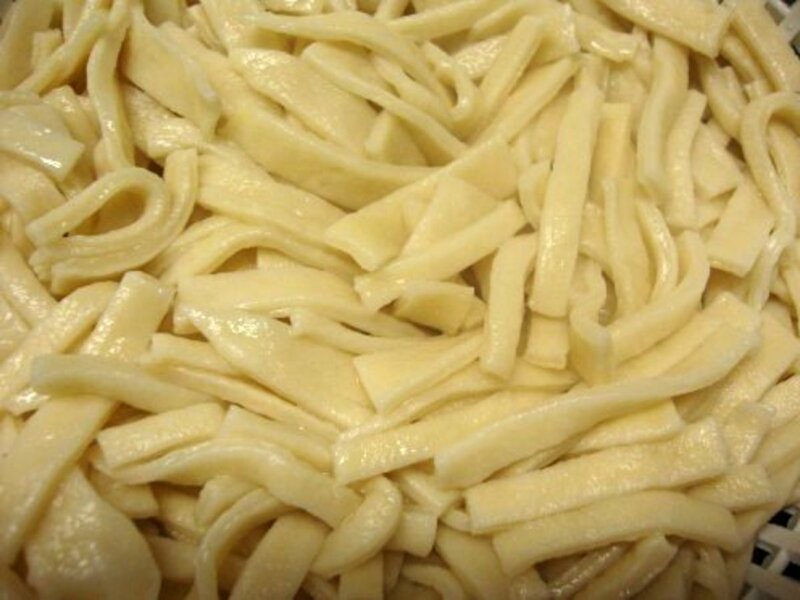 My grandmother use to make homemade pasta all the time - espesically fusilli - one of my favorites. Recently, I wanted to make lighter airier - healthier pasta for my daughter. 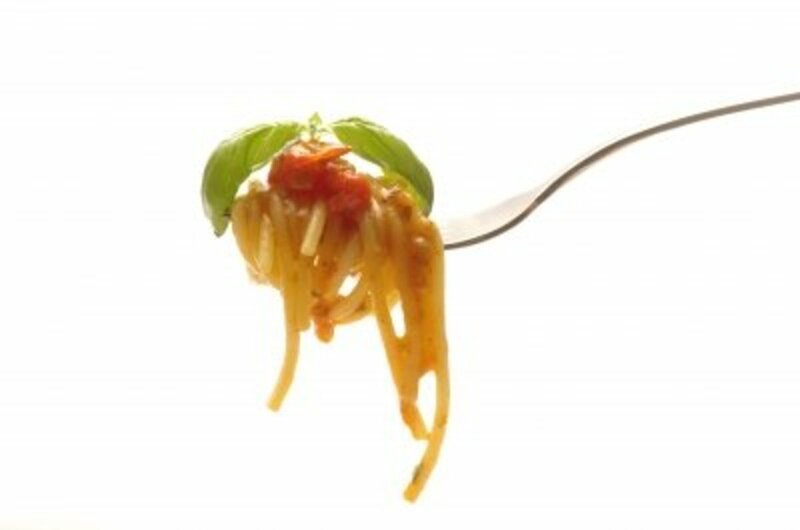 Have you ever made any pastas with other ingredients? I was thinking more like using root veggies - beside potatoes - perhaps even comboing it with a more healthier veggie. Like taking baked yucca, turnips, parsnips, etc. 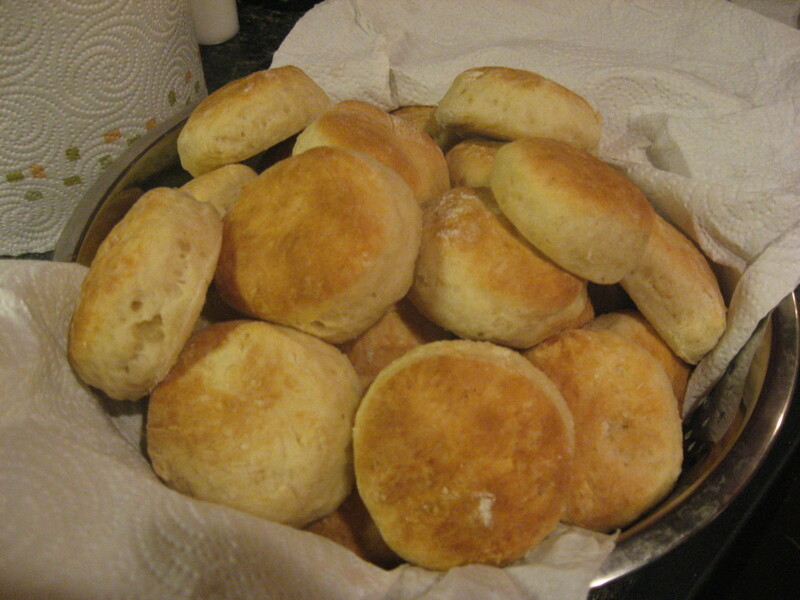 baking them and then mushing and combinging with flour to make a pasta. I was wondering if you have ever tried anything like this? Thanks. edig694~ I would say count on this recipe feeding 3 Italians! LOL! You are funny. I am making "homemades" for my family of 26! for my father in memory of his mother who made it weekly. Unfortunately she isn't here to instruct me. Your instructions are the best I have seen. feeling less intimidated. How many Italians will this recipe feed? gmWilliams~ I agree with you 100%! Nothing is better than homemade foods, and pasta is the best homemade food in my humble opinion. It is as if you can taste the love! Thank you for stopping by today. I appreciate your comments. This is a great article. Cooking from scratch is always more wholesome and more nutritious. Bobbirant~ I can not agree more. The texture and flavor can take you to a place where your taste buds will want to live forever. Thank you for passing through and commenting, I really appreciate your time! 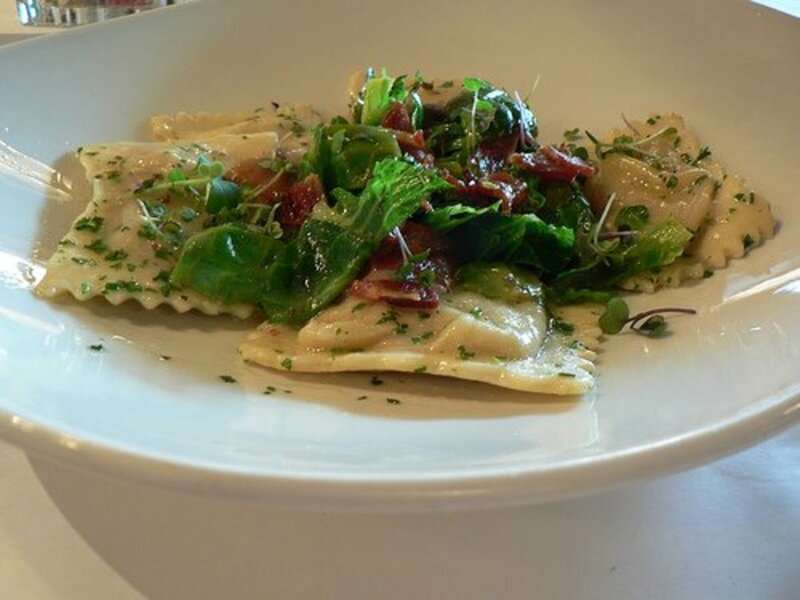 Nothing tastes as wonderful as fresh, homemade pasta. Unless a person has tasted it, they cannot imagine. Great hub. Wildiris~ Semolina is of course the traditional Italian pasta flour, a coarser grain flour ground from hard winter wheat. SEMOLINA FLOUR IS USED TO MAKE MOST DRIED PASTAS. It contains a ton of gluten, which provides elasticity to the dough, making it less likely to rip during the kneading process--allowing the dough to be formed into a large variety of shapes--also helping the dry pasta retain its structure when re-hydrated. The semolina flour is far more difficult to work with and makes a stiffer pasta dough. The "00" flour makes a delicate silky pasta dough, much more pleasing on the tongue in my opinion, and feeling more gourmet when eaten. Some people have a difficult time digesting the semolina flour pasta's, causing them gastrointestinal discomfort, so the "00" flour remedies this all together (providing there are no gluten allergies on board). Great question! Good luck with your next pasta adventure. 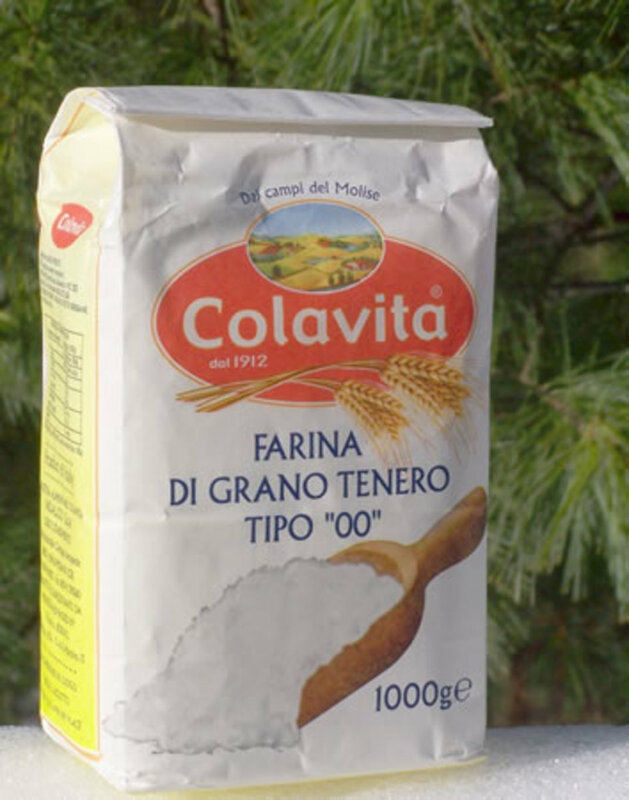 Try looking for "Colavita" -or- "Tipo 00" flours, they can be found online quickly using these keywords. I didn't know about special Italian flour for pasta. I'm going to make the effort to find this. I make pasta by hand all the time, but I'm not always pleased with the results. Your Hub has inspired me to continue working on trying to make the perfect pasta. Why do some fresh pasta recipes call for semolina flour? HT~ What a super idea, making pasta with your kids sounds really fun. 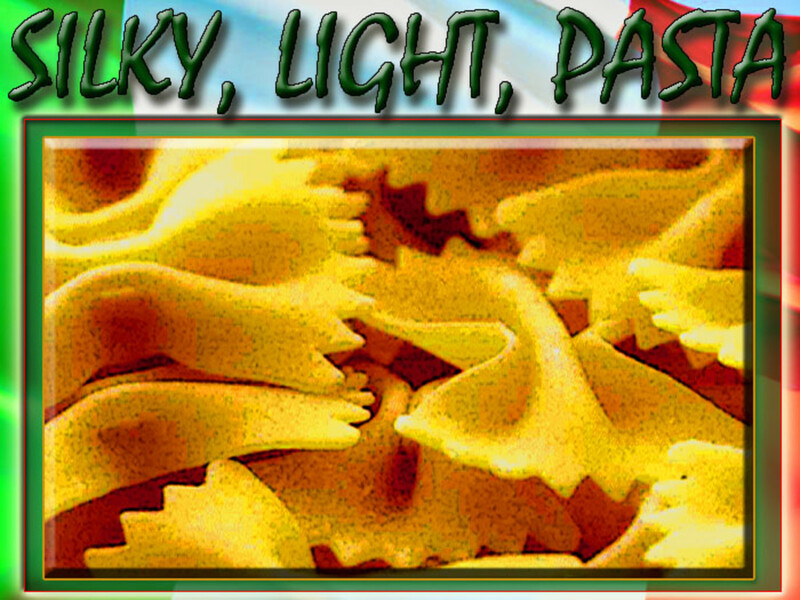 I sure appreciate your comments and you taking the time to stop by to read this fresh pasta hub! I really enjoyed reading this hub. I am so hungry. I am definitely going to do this with my kids as a fun family deal. Darlene Sabella~Thank you for your comments. Darski, sometimes child-like appearing foods are all I think about and crave! I will know where to go when this craving pops up again. I really appreciate you stopping over for a read. Lady_E~ Very cool to see you stopped by today. Thank you for the comment and your time! You are sooo right, fresh homemade pasta IS a much healthier choice then pre-packaged pasta. 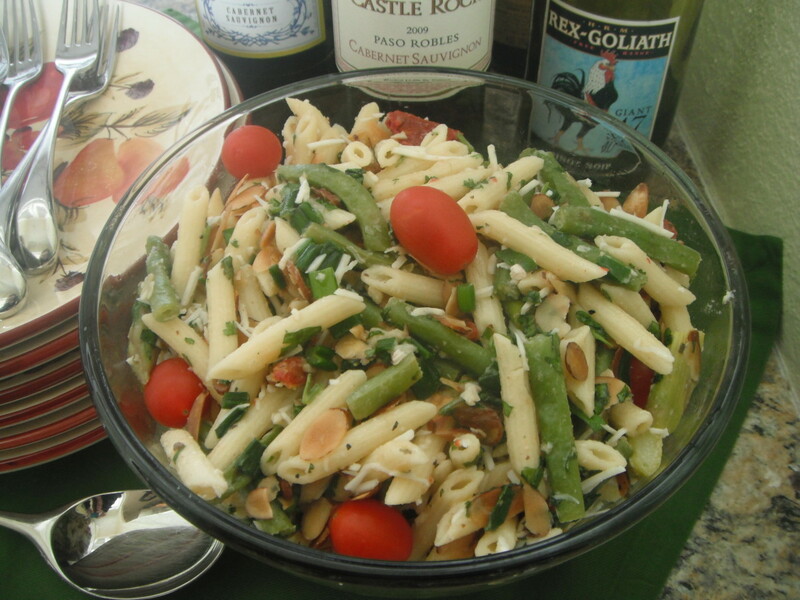 Controlling the ingredients can surely offer healthier options to any pasta recipe! Thanks for this. It's a very healthy Recipe to. stephhicks68~ Wow, thank you so much for your very sweet comment. I really hope you give it a go, there really is no comparison between fresh pasta and store bought pasta--even the stuff they call fresh pales in comparison. This comment box brought me a big smile Steph, and I needed that today! Pamela99~Grateful you stopped by Pam. I hope that the pasta instructions are really easy to follow, because it truly is a simple thing to make! BTW, I really enjoyed your hub review on Parenthood – Controversy over Amy Chua's Book- Tiger Mom, quite a stunning opinion the author takes. Thanks for your comments. Eiddwen~How fun! I can't wait to hear back on how tasty your fresh handmade pasta comes out! You'll never want to buy store bought pasta again. I hope you guys find it a wonderful experience. I'll look for your results. Thank you for taking in this read and for commenting! Hi I will definitely trying this one and I'll let you know how it went. Very good instructions for making pasta which is something I have never done. Thanks for the good instructions. Let me just tell you that the phrase, "Fresh Pasta is like placing a silk scarf across your tongue in texture, while offering a rich, flavorful, and savory vessel for sauces, oils and ingredients to rest upon," is one of the most enticing, beautiful descriptions I've ever read in a food hub! And, I'm now thoroughly interested in making my own! Rated up and awesome - great job!